If you know you have to go straight from work to a nice dinner, it’s easy to plan ahead so that you can look special without having to do a complete change of clothes. First off – even if you wear jeans, a nice silk tee shirt can spend the day under a cardigan and a scarf, but then can stand on its own with a gorgeous necklace and festive, but still comfortable, shoes. A beautiful blue blouse (that matches your eyes?) looks perfectly serious and businesslike under a cardigan during your business day. But lose the cardigan, pop on some dazzling earrings, and a slightly dressier shoe, and you’re ready to go. If you have any reason to believe that you’re going to have to carry a drink around, shake hands, and maybe juggle an appetizer or two, a small cross-body bag is essential. As much as we love beautiful clutch bags for dressy events, sometimes you have to have your hands free! Even if you work in a suit, you can still chose a beautiful blouse that will stand on its own later in the day. 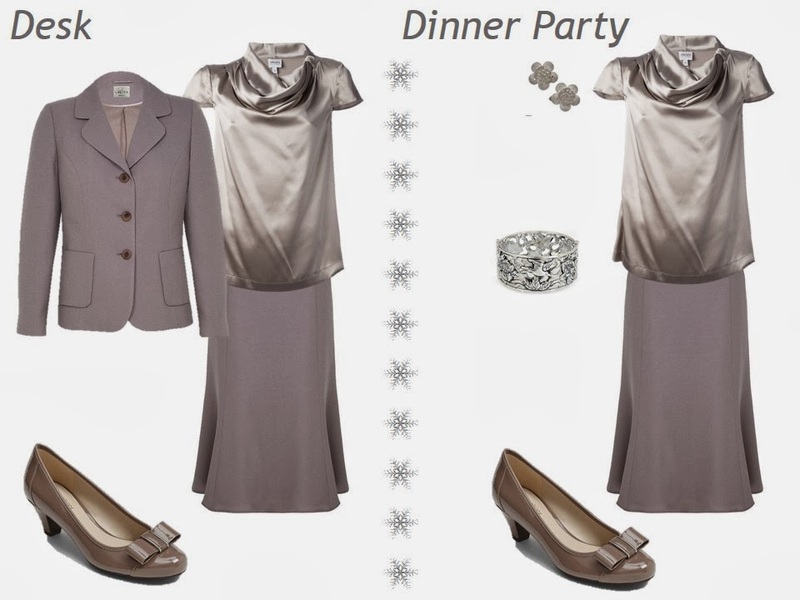 Some silver jewelry that will show at the dinner table will make all of the difference to make your holiday-worthy! Rosi, Your English is very good for a non-native speaker. Don't be afraid to keep posting. Such graceful feminine outfits! For decades, I had a serious silk blouse addiction. One year I realized that (in my northern climate) they felt good abut 3 weeks a year, just too cold for my body most of the time, and hot in summer. But I adore their luxury and drape. You make me want them again. I have been very pleased to see woven blouses with drape (not shirts) making a reappearance, as they just look more elegant than knits and seem to fit me better than shirts. Silk blouses work great as a breathable option compared with polyester and feel lovely next to your skin. Lately, I am finding myself more inclined to natural fibers for comfort throughout the day. Ann Taylor has some fairly affordable options, too. You created beautiful outfits here. And I want that Philip Lim cardigan. It is the perfect example of menswear created for women. All good ideas and not costing a fortune. thanks. I love this series and have a related question. How can I dress festive for each season if the core colors are not part of my capsule? These posting work for many events this time of year but I will also attend a few events where I need to wear something red or green despite neither being in my capsule.